• A superb colour guide to Operation Cobra, complete with over 800 photographs Operation Cobra was the codename for an offensive launched by the First United States Army eight weeks after the D-Day landings, during the Normandy Campaign of World War II. Unfortunately, due to sales rights restrictions, we cannot offer Operation Cobra for sale in your country. Operation Cobra was the codename for an offensive launched by the First United States Army eight weeks after the D-Day landings, during the Normandy Campaign of World War II. American Lieutenant General Omar Bradley's intention was to take advantage of the German preoccupation with British and Canadian activity around the town of Caen, and punch through the German defences penning in his troops while his opponent was distracted and unbalanced. Once a corridor had been created, the First Army would then be able to advance into Brittany, rolling up the German flanks and freeing itself of the constraints imposed by operating in the countryside. After a slow start the offensive gathered momentum, and German resistance collapsed as scattered remnants of broken units fought to escape to the Seine. Lacking the resources to cope with the situation, the German response was ineffectual, and the entire Normandy front soon collapsed. Operation Cobra, together with concurrent offensives by the Second British and First Canadian Armies, was decisive in securing an Allied victory in the Normandy Campaign. 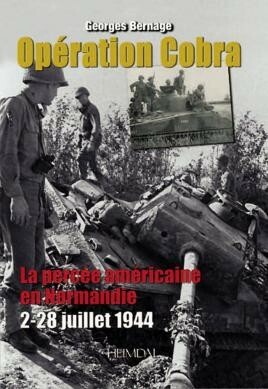 This highly illustrated book describes the very hard fighting of the U.S. forces south of the Cotentin peninsula, from July 2 to 15 1944, and the following lead up to Operation Cobra. ...for modellers it will be the very extensive photo content that will attract you to this one, much of which I have never seen before. The build up and combat of ‘Cobra' is documented in a diary format but the real stars of the show are the superb collection of photographs... the text is French but the words are certainly secondary as modelling reference as the images are of such good quality and of great potential modelling subjects.